Description: This German-Bohemian composer (Václav Jindřich Veit if you’re Czech) is one of music’s more unjustly forgotten figures. As these quartets reveal, he is not only the link between the Bohemian composers of the end of the Classical period and the wave of Czech Romanticism that began with Smetana - he is also an outstanding composer in his own right. His four quartets trace the stylistic evolution of his time: they emerge from a debt to Haydn and Beethoven and embrace Mendelssohn and Schumann, with moments of a Schubertian lyricism on their way to pre-echoes of the young Dvorak. 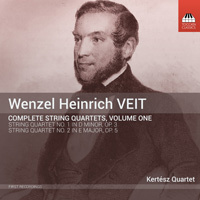 Composed within a short period of time (these two are from 1834 and 1835 and are each just over a half-hour in length), they join five string quintets and a symphony among his instrumental compositions. Nos. 3 and 4 will be released in the future. Kertész Quartet.